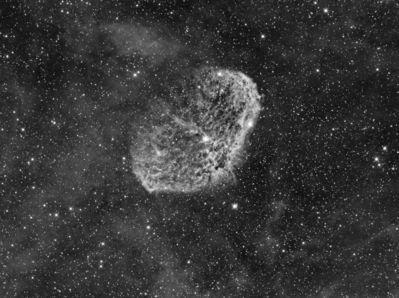 The Crescent Nebula (NGC 6888) is an emission nebula found in the constellation Cygnus. A leading hypothesis suggests that the strong stellar winds from the central Wolf-Rayet star collides with the stars outer atmospheric envelope ejected in a previous evolutionary phase, which energizes the nebula and leads to the observed structure. This H alpha image is a total of 5 hours of exposure taken with a Takahashi CCA-250 f/5 astrograph and QSI683wsg camera (Astrodon 5 nm Ha filter) on a Paramount ME; August 11th , 13th 2015 in Mayhill, NM (15 x 1200 sec lights @ -20o C; 21 darks; 126 bias; 128 flats) Image acquisition MaxIm DL 6.08; Calibration, alignment, integration, and processing in PixInsight 1.8.4.1107 Ripley (x64).